Noise canceling headphones use the science of acoustics to actually remove much of the unwanted noise from your ear. Noise canceling technologies generally work by first detecting the sound coming into your ear via a microphone located on the outside of each earpiece. An internal sound processing amplifier then creates an inverted form of the sound and injects that into the ear canal where it mixes with the ambient sound as it travels into the ear canal. The two sounds then mix their offsetting waveforms to produce a much lower volume of sound by the time they both reach the ear drum. Although not perfect, noise canceling headphones are an ideal solution where the noise you want to remove is relatively constant and where the sound level is fairly high (60 dB or greater). 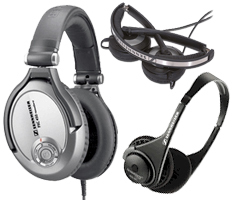 Noise canceling headphones, even the expensive models such as are made by Bose, do little to block rapidly changing sounds such as human speech, babies crying, or music. However, when you are subjected to a constant loud noise, such as found in routine airplane travel, noise canceling will seem like magic to you. These headphones cancel outside noises so you can listen to your music or the in-flight movie in peace. They offer good quality sound and noise canceling. A great, affordably-priced alternative to Bose noise canceling headphones: these are ANC flying headphones for the rest of us!